Why Use a Rheumatology Fellowship Personal Statement Writer? Applying for a rheumatology fellowship or a sub specialty pediatric rheumatology fellowship means facing stiff competition. If selected the road to qualification is long and demanding. To impress the fellowship selection board you must first convince them that you are qualified and committed to becoming a rheumatologist. An excellent personal statement will make you stand out and encourage the board to find out more about you. It has to read well, contain no obvious mistakes, and outline the skills and motivation which make you a top candidate. Writing statements which do this is not easy and many people turn to our service for help. Our writers tailor your personal statement to your specific application, be it a rheumatology fellowship, pediatric rheumatology fellowship or any sub field such as immunology. 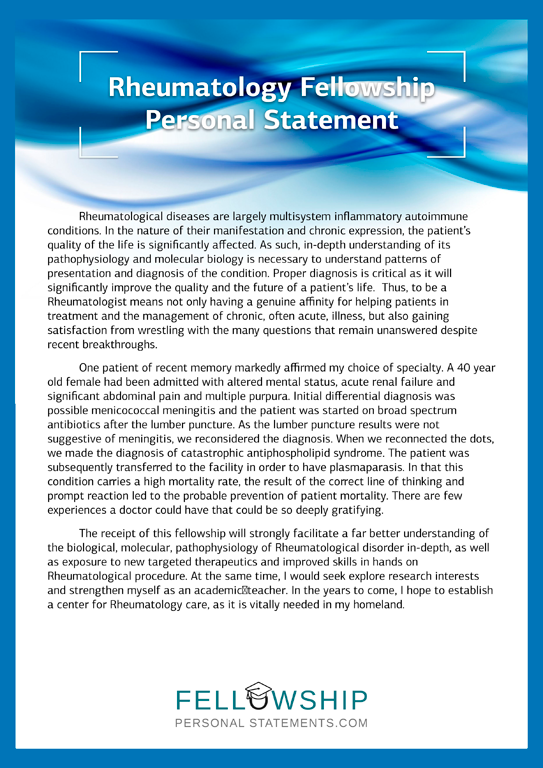 The statement is written to portray you as a high quality candidate and will outline your personal and academic qualities, why you chose rheumatology, and why it suits you. Under graduate and intern studies. The board wants to verify that you have a foundation of general medical practice as well as sound research skills. Why a rheumatology or pediatric rheumatology fellowship? You enjoy working with children, rheumatology is your chosen field and you are good at, the board will want to know why you applied for the post. Your future? Awarding you the fellowship post is a big commitment by the board. They will want to know how you plan to use your skills in the future. Why this location? The school has a good reputation, research programs of interest to you, or you wish to live in a certain area. Showing you want to be part of their staff will increase their interest in you. We employ high quality writers for preparing both pediatric fellowship personal statement and rheumatology fellowship personal statements. They are proficient English speakers, have an advanced degree in a subject relevant to your application, are familiar with the application process and are experienced in writing statements. Working directly with you they prepare a statement comprising all the required information. “It was always accepted that college was on the agenda when I was growing up. I was fortunate enough to come from a family that values education and planned for college early on. My aptitude for the sciences was noticed while in high school, and I entered college with medical school in mind. During medical school I opted for an internal medicine residency with the eventual goal of applying for a Rheumatology fellowship. My mind became set on Rheumatology even before entering medical school. During my first four years of college I volunteered at a rest home for the elderly on a regular basis, knowing that it would help my application to medical school. I enjoyed my work there and often chatted with the residents. A common complaint many of them had was the affect arthritis had on them, and how it limited their activities. Knowing I planned to apply to medical school, some of them would tease me about becoming a doctor and curing their aching bones. On such simple things are some of our biggest decisions made. I wasn’t instantly inspired to focus on rheumatology as a career. Rather, after a couple of years of hearing the jokes, the idea gathered momentum. During medical school I took every opportunity to learn more about the field, and began working on building a CV that would make me a suitable candidate for a Rheumatology fellowship program. The research I have been involved with, the projects I have done and papers I have written have been aimed at that goal. Once I decide to do something, I want to perform at the highest level I am capable of. What Is Included in Our Service and What Quality Guarantees Do You Have? Our fellowship personal statement writer will contact you through our services and they work with you to get all of the information you wish to see on your fellowship personal statements. Your statement is prepared, proof read, checked for plagiarism then delivered to you, always before your deadline. Working with your writer as many revisions as needed are allowed. We believe you will be more than satisfied with our service such that we include a money back guarantee. So if you are looking for a better chance of acceptance ask our experts to write your rheumatology fellowship personal statement today!